It's Facebook Fridays! for January 26, 2018, and we're here to help you to hold onto your moolah! The Lucky Mojo Curio Company is holding a random drawing to give away 8 powerful spiritual supply prizes designed to keep your hard earned cash in hand. 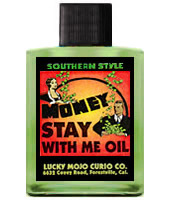 This week our lucky winners will each receive a bottle of hand-made Lucky Mojo brand Money Stay With Me Oil which you can use to dress your coins and cash, reduce unexpected expenses, and live within your means as your savings and your income increase. First thing tomorrow morning, we will select EIGHT winners at random, announce their names here, and ask them to message this Facebook Page with their mailing addresses, so we can send them their FREE Money Stay With Me products. We have a winner! In fact, we have 8 lucky winners! Our Facebook Fridays! winners for January 26 2018 are: Collins BlaquePearl Carletta, Cindy Corbett, CJ Burgan, Christie Chaffee, MzShawnie Murray, Rodrigo Concha, Jason Lentz, and Benita Taylor.